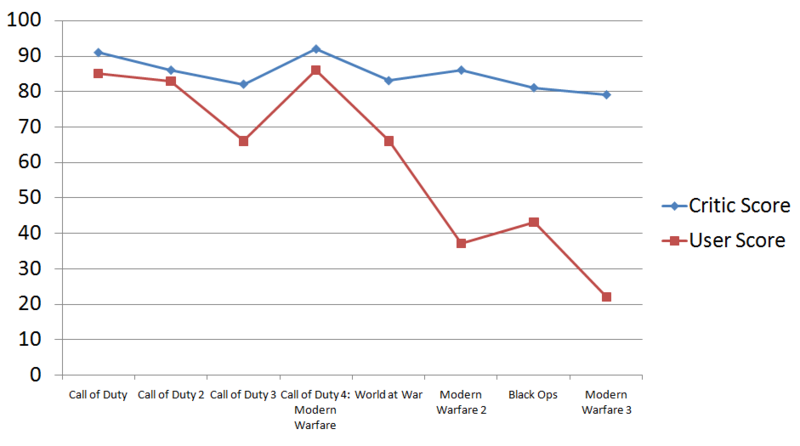 While stumbling through reddit, which BTW takes up far too much time in my day, I came across this chart that plots the critic and user scores for each Call of Duty title over the years. What is most surprising really is how the user score is following such a solid trajectory while the critic score is relatively stable. Now I personally disagree with Metacritic allowing use scores on the site as it’s simply become a way for the trolls out there to voice their displeasure. It doesn’t matter how little you think of Call of Duty there is no way that it deserves a score of 22/100. That’s just a useless measure. However what is interesting is that even though the user scores started trolling the title at Call of Duty 3 critics and users alike loved Call of Duty 4: Modern Warfare and the series has pretty much been in steady decline since then. If Black Ops 2 doesn’t average out over 85% this year I wouldn’t be the least bit surprised to see Activision put Call of Duty on a hiatus for a year or two. There is no point killing the franchise entirely.